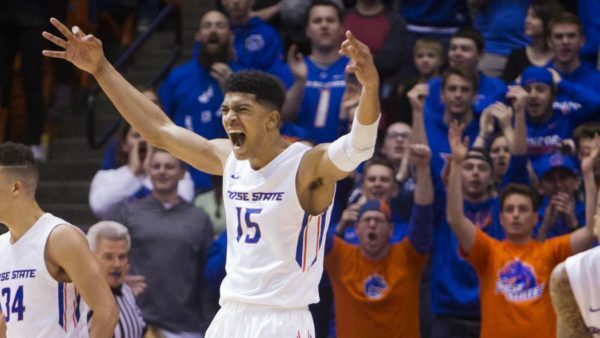 Chandler Hutchison – Boise State. Some scouts project the 6’7″ swingman to be a fringe First Round pick in this summer’s NBA Draft. Most hoops junkies already know he’s the best player in the Mountain West. KenPom currently ranks him as the ninth-most valuable player in the entire country. Still, it might take a Herculean effort in the NCAA Tournament — much like the 44-point night he had against San Diego State on January 13 — for the senior to register on the national landscape. If Boise State can upend Nevada at home tonight, it will be a huge step in helping Hutchison get there. Nick King – Middle Tennessee State. The Blue Raiders lost a lot from last season’s team which upset Minnesota in the NCAA Tournament, including all-conference forwards JaCorey Williams and Reggie Upshaw, Jr. No Matter. 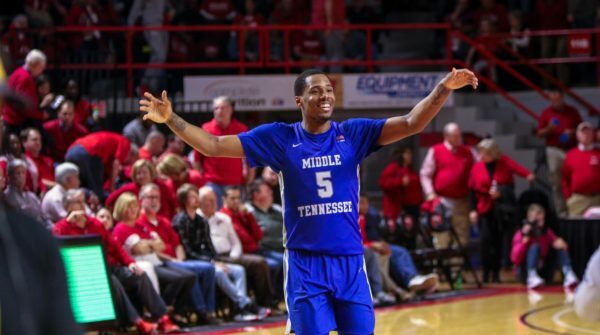 King, who began his career as a highly-touted recruit at Memphis before transferring to Alabama and winding up in Murfreesboro, has helped Middle Tennessee State remain atop Conference USA in 2017-18. The 6’7″ senior is averaging career bests in points (21.4 PPG) and rebounds (8.2 RPG), his versatility and mobility proving too much for opposing frontcourts throughout the league. But can he be as effective against high-major foes, you ask? Absolutely. In five games against power conference opponents this season, King has averaged 23.2 PPG, including 28-point efforts in close losses to Miami (FL) and USC. If the Blue Raiders return to the Big Dance, King will most certainly enter the national consciousness. Jock Landale – Saint Mary’s. You probably already know of Jock Landale, but do you realize just how good he’s been this season? The 6’11” Aussie is the only player in the country to rank in the top 15 nationally in both scoring and rebounding, neither statistic of which quite does his excellence justice: Landale is also perhaps the most efficient player in college basketball. He leads in the country (by a mile) in offensive rating among heavily-used players. He boasts the 14th-best effective field goal percentage (66.1% eFG) while ranking first and second, respectively, in defensive and offensive rebounding percentage among WCC players. He currently ranks second behind only Trae Young in KenPom’s Player of the Year rankings. Every time he touches the ball, good things happen, and it’s the biggest reason why Saint Mary’s — the nation’s fourth-most efficient offense — looks like a second-weekend contender. Landale should have more national name recognition than he does, but he might finally get his due next month. Zach Lofton – New Mexico State. There are several reasons Lofton’s poised to become a household name in March. For one, he’s really darn good. The 6’4″ guard ranks second in the WAC in scoring (20.0 PPG) thanks to performances like the one he had against USC in the Diamond Head Classic (28 points on 6-of-9 3FG). His team, which is ranked 43rd nationally in KenPom, is in excellent shape to reach the NCAA Tournament. Finally, Lofton’s story is remarkable. The St. Paul native began his career at Illinois State before transferring to San Jacinto College and then to Minnesota (where he was dismissed), before winding up at Texas Southern, where he was named SWAC Player of the Year last season. Now as a graduate transfer at New Mexico State — yes, his fifth school — Lofton has a legitimate chance to win Player of the Year honors again in an entirely different conference. Jonathan Stark – Murray State. The Racers are having their best season of the Matt McMahon era thanks in no small part to Stark, a 6’0″ guard who puts the ball in the basket. The senior leads the OVC in scoring (20.9 PPG) thanks to incredibly deep range (42% 3FG on 192 attempts), outstanding quickness and change of direction, and impeccable free throw shooting (91% FT). Stark scored 21 points and registered a career-high five steals against Auburn in December, a game Murray State nearly won. 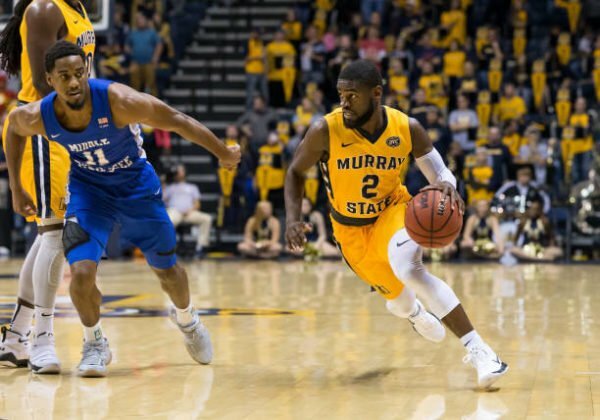 For a team currently ranked 61st on KenPom with an even higher-ranked offense to match, that result may be a sign of good things to come: The last time the Racers earned a top-70 KenPom ranking during the regular season, they won an NCAA Tournament game. This entry was posted on Wednesday, February 14th, 2018 at 12:21 pm by Tommy Lemoine	and is filed under feature, microsites, other 26. Tagged: Jaylen Adams, jock landale, Jonathan Stark, kermit davis, middle tennessee state, mike daum, murray state, Nick King, ohio valley, saint mary\'s, st bonaventure, st mary's, summit league, Zach Lofton. New Mexico State. You can follow any responses to this entry through the RSS 2.0 feed. You can leave a response, or trackback from your own site.